Steven (Chicagoland, United States) on 19 November 2012 in Architecture and Portfolio. Hearst Castle is a National and California Historical Landmark mansion located on the Central Coast of California, United States. It was designed by architect Julia Morgan between 1919 and 1947 for newspaper magnate William Randolph Hearst, who died in 1951. In 1957, the Hearst Corporation donated the property to the state of California. Since that time it has been maintained as a state historic park where the estate, and its considerable collection of art and antiques, is open for public tours. Despite its location far from any urban center, the site attracts about one million visitors per year. Hearst formally named the estate "La Cuesta Encantada" ("The Enchanted Hill"), but usually called it "the ranch". 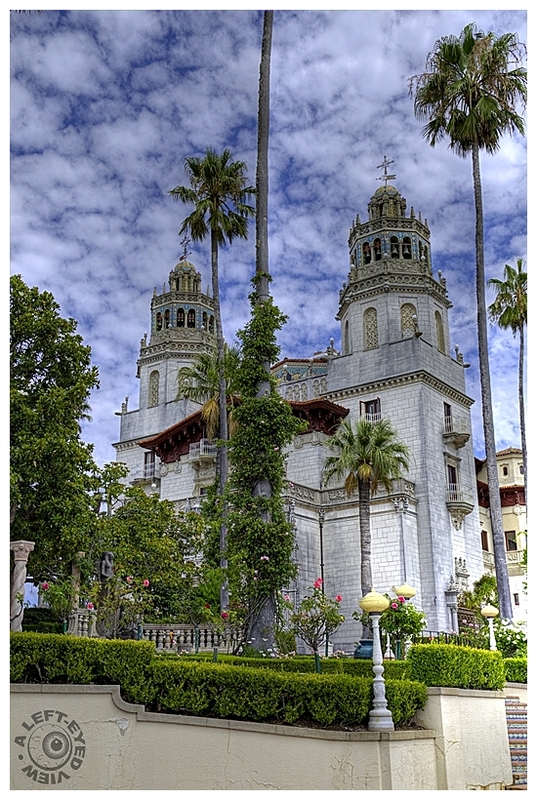 Hearst Castle and grounds are also sometimes referred to as "San Simeon" without distinguishing between the Hearst property and the adjacent unincorporated area of the same name. Photo captured August 17, 2012. A very beautiful capture with a marvelous perspective and beautiful colours. Stunning shot, this really shines Steve. This is an extremely fine image and you must have booked that sky months in advance ! Beautiful shot, Steven - captures all the grandeur of the Hearst myth and mystique. A grand photo of this great place. I am fascinated by this amazing property. We visited it a number of years ago and took all the tours including the one at night where the locals dress in period clothing. Superbe château et un beau cadrage des deux tours ! Splendid image with wonderful textures. What a remarkable place. Very impressive architecture and scene; great information! Beautiful photo! Nicely done HDR. Excellent perspective control. Excellent. An amazing place. In 2003, I rode my bike from Astoria, OR, to San Simeon. Gorgeous, ornate architecture and a wonderful shot of it with your usual spot-on processing.